CIR has been publishing a report on the latest opportunities in the Active Optical Cabling (AOC) space for almost a decade. In our 2018 AOC report CIR projects the future of the AOC market, focusing on how AOCs are adapting to current technical and market trends. The report is particularly concerned with how AOCs and embedded optics will coexist and how AOCs will fit in with current data center trends; both the huge data centers that the cloud service providers are building and the smaller enterprise data centers that are resulting from the rise of the cloud itself. We also take a look at how AOCs can increasingly be messaged as part of power consumption strategy for data centers, replacing the old story of AOCs replacing bulky copper IB cables. In this year’s report CIR is putting more emphasis on how the supply chain structure for AOCs varies around the world and who are the leading players are for each region. 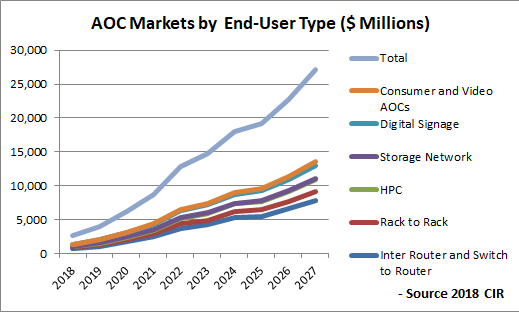 As with our previous reports on AOCs, this report also includes analyses of how AOCs are being adapted to the latest MSAs, especially those at 100 Gbps and 400 Gbps, and whether AOCs will ever emerge as a consumer electronics item – a long promised development. This report provides an insider perspective on what’s next in the AOC business. It is strongly focused on business strategy and examines all the important marketing issues faced by the AOC market. The report also profiles all the leading suppliers of AOCs including established players, emergent Chinese vendors and the latest innovators, along with quantitative market shares of the AOC market leaders. Finally, the report includes ten-year volume and value forecasts, broken out by data rate, MSA, networking standards, fiber type and length of cable. E.1.1 What is today’s competition for AOCs: Is copper still a factor? E.2.1 Chinese suppliers: Will they ultimately dominate the AOC market? E.2.3 How big can the Chinese share of the AOC market grow? A.4.6 Consumer and video AOCs: Display extenders, video editing, gaming, etc.